Welcome to Gasthaus Forelle in Siegsdorf im Chiemgau, a quiet and charming village in the middle of lakes and inspiring mountain landscape, characteristic of the Upper-Bavaria region. 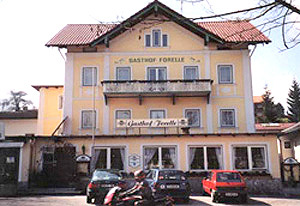 The hotel is not far from Inzell and can be also reached from Salzburg, which is about 40 km away. The surroundings offer countless possibilities in all seasons for sports, recreation and sightseeing. These include the nearby Winkelmoosalm ski centre, the Chiemsee and KĂ¶nigsee lakes, the Herrenchiemsee Castle, and much more. The guest rooms are warmly appointed, comfortable, and all feature a bathroom with a shower and WC, TV, and telephone. A varied buffet breakfast with fresh and tasteful products of the region is served every morning in the hotel's breakfast room and, during the day, you can taste traditional Bavarian specialties in the Farmer Room. The Beer Garden is the perfect place to have a cold beer during the hottest days while in the Zum Heurigen Bar, with its countryside decoration and friendly atmosphere, you can have a glass of excellent wine or a beer at the end of the day. The homely and relaxed atmosphere of this small, family-run establishment make it an ideal destination for weekend getaways as well as for longer, stress-free vacations, both in summer and winter. Prices per night per room. Tax and breakfast are included in the price. The hotel enjoys an idyllic location in the town of Siegsdorf, in the middle of lakes and mountains, and not far from Inzell (12 km).